Chitra Amma's Kitchen: Simple Hituku Bele and a Visit to the Avare Bele Mela! Simple Hituku Bele and a Visit to the Avare Bele Mela! and a Visit to the Avare Kai Mela! I have already blogged about Avare Kaalu (or Hyacinth / Lilva / Navy Bean??) in this post a few days back. 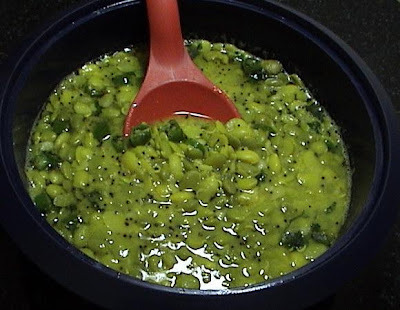 Here is yet another Avare post, to share the excitement of the Mela (Festival) in Bangalore, as well as a very simple and tasty dal (lentil) we have at home. As per my experiences of Melas in general – whether it is the village Santhai at Valiapatti, or the Farmer’s Market at Portland, they are a flood of stalls and vendors spread out in large open areas! So little did I imagine that the famous Avarekai Mela at Bangalore, would be confined to a mere crowded shop at Sajjan Raw Circle, and few pavement sellers! My initial disappointment was quickly replaced by excitement, as I entered the shop with my husband and Yosee. As we wended our way through the avaricious crowds, we could glimpse through the multitudes of preparations, packed and stacked in rows and rows of shelves. Nipattu, Chakli, Mixture, Avalakki, Ladoos, Chikkis, and many more snacks were available, where avare bele was liberally thrown in. 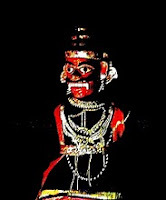 The spicy fried avare bele was the only chaste avare preparation, as it was not corrupted with any other ingredient. Avare Kai enthusiasts seemed to be pouring in on and on but no one seemed to leave at all. As the crowd kept swelling, we came out of the shop after a few purchases. There were chefs cooking a dozen dosas at a time on large tavas on the one side and efficient hands were rolling out delicious obbattus on the other side. Hot Uppittus and even Bhel Puri was being sold. The flavoursome Avarekai Saru accompanied the ‘hot hot dosas' which were embedded with cooked avare bele and minced onions. Masala Vadais were also selling like hot potatoes, or should I say, like avare beles! The unusual sweet Avarekai Payasa was another attraction for children. My husband who is the honorary photographer for the blog went berserk with so many Avare Kai dishes around him. He alternated between buying and clicking and finally we made our way to Yosee’s place, fully loaded with parcels of Avare Kai dishes. After enjoying a buffet tea of the dishes, we thankfully washed it down with a hot cup of filter coffee offered by Yosee. Back at home as we sat loading the pictures into the computer, a sense of fulfillment over took us. I have shared what is ‘Hituku Bele’ and how the beans are squeezed out of their membraneous skins in the earlier post here. Lakshmi shares the technique here. Squeezed Beans are readily available as well, if you want to skip this laboursome task. 1. Boil two cups of water in a wide pan and add the lentil. 2. Add turmeric powder and asafoetida and cook till tender but not mushy. 3. When the bele is cooking, mash one portion of the bele with the back of the ladle inside the cooking pan. 4. This will give a consistency to the bele. 5. Stir well and add salt and cook for two more minutes. 6. Blend in the lime juice and switch off flame. 7. Heat oil and add mustard seeds. 8. After it splutters add the chopped green chillies. 10. Garnish with fresh coriander. Relish the simple, light and delicious hituku bele with rice or rotis. This post goes to Srivalli's My Legume Love Affair-7th helping. 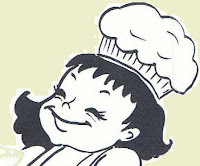 My Legume Love Affair was started by Susan of The Well Seasoned Cook. We simply love all avarekai dishes and that was a great info and photos on avarekai mela. Did Vasavi condiments people forgot to sell Omam water? ahahahaa....coz people need it after that heavy dose of avarekai. oh this is such a simple dish. will try it with some other dal as i dont have this one. 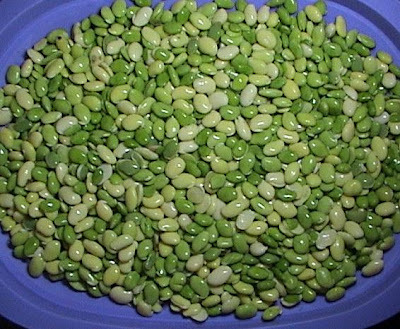 wow, avare beans look so beautiful. Never heard of these. Lovely dish! thats a nice dish and lovely post..have never tried this beans..now , I badly want to after seeing your post and lakshmi's post a few weeks ago..
Wow..so many dishes with averakai... Never cooked with the beans alone. Its always along with the pod. Mahima - Thanks. The unique taste of this bean makes all the difference for this dish, however but any other dal will also taste good! Sowmya - Thanks. If you are in India its easy to get it! Jayasree - That's a different flat variety dear! These pods are fibrous and hard, and need to be discarded! Some dishes are unimaginable with avarekaalu.. obbattu..Full overdosa of avarekalu eh??? I love the crunchy mixture though!! NOT FAIR!!! All I get here is dry Avarekalu or horrible tasting frozen Avarekalu!! I love Avarekalu Uppittu. Very interesting post, Dibs! I love the spiced averekai esp. from Srinivasa Iyengar Bakery! There - you made my mouth water suddenly!! Looks like you had fun. I have never had this. Boy, Dibs, this is one amazing post. For a moment there I was at this buzzing store/mela, gorging on chaklis and everything else. Thanks for sharing a lovely recipe. Your husband did a fantastic job on the photography! I am in love with this bean already!!!! Your pictures are vibrant and a pleasure to look at! Lovely recipe Dibs! Pics looks tempting!